One of the many benefits of belonging to a small church is the opportunity for our kids to grow up around all different age groups... it's not something everyone has the privilege of! Families tend to hang out with other families who have children in a similiar age bracket (trust me, we do a lot of that too - just so convenient when the children all get along and play nicely together), but there is something special when you see your child bonding with folk who are of a different generation. Watching my children strut around church like they own the place brings back so many precious childhood memories of my own... like them, I was brought up in a small town church, and while I was blessed enough to have had my best friend attend the same church all the way through; I have very fond memories of everyone. I am still in touch through Facebook with many folk from that church, most of them are totally different age categories to me - some younger but many older, they remember me as a young teen, and I remember their children as preschoolers; and yet somehow we have a shared bond that has stayed strong through the years. I wouldn't change my childhood for all the gold in the world... and I want my children to feel the same. I want them to grow up loving church, to strut around like they own the place (within reason of course *grin*); to acknowledge and embrace the older folks, to cuddle and care for the little ones; and to have a no understanding how how rare a thing this is. To assume it is normal that you invite folk over for meals, whether or not they have children your age to play with; to assume it is normal to help the older generation when they start to become less independent, to assume everyone cooks meals or bakes cakes for those who need cheering up, and that even in this day and age you get to know your neighbours well. We don't do it all, and we don't always do it well - but we try, and that is what I want my kids to see... Our life is not all about us, and it is definitely not all about them; there is a big, wide world at there with a lot of folk who could use a smiling face, a helping hand and a meal or two. Our neighbour has been such a blessing to us as well - her eldest son is a very close friend of my husbands, and I have also known her (through different sources) for many years; so it just seemed natural that we took her into our family also. She comes over a few times a week during the day for a coffee and a chat with Luke, the kids pop over to her place whenever they feel like it (she sends them home when she has had enough, so we don't worry about whether or not they are being a nuisance), and she has dinner with us at least once a week. We had a mid-winter marshmellow toasting evening 😆! 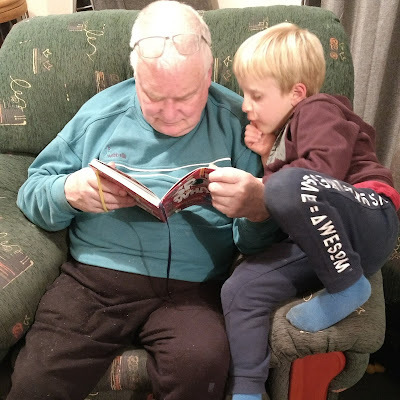 It was seriously, the sweetest thing EVER; and I am pretty sure Wally loved it as much as we loved watching them (neither of them even noticed me take this photo, they were so engrossed in the book). I know this may mean the kids have to 'say goodbye' to friends more regularly than they otherwise would, but I also believe that friendships like these enrich their lives forever. I hope they grow up with a love and concern for the elderly in their lives and neighbourhoods, as they leave home and venture out on their own. That through these experiences they have a much more balanced appreciation of what makes a community, and also a deep and abiding love of history. 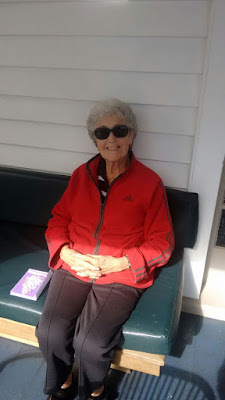 In Auckland, we had to say goodbye to a much loved elderly friend - 'Nana Hilda', whom we still visit every time we go up. She was a neighbour of ours before the children were even born, and just took liking to Luke and I; she totally adores the children, and has been a part of both their lives ever since they were born... It will be a massive loss when she goes, but I would have hated to have missed these past few years with her. She, like Wally, is English and they both lived through WW2 as children - Wally was very young, and doesn't have a lot of memories, but Hilda was a bit older and her memory of those times is still very strong; and we have loved hearing her understanding of what it was like back then. And it's not just church folk we have had the privilege of introducing our children too down here... One of the advantages of moving back down here specifically was family - when we first arrived 2.5 years ago, both sets of Grandparents lived here, and two sets of my Aunts and Uncles lived close by (as well as my own brother and sister-in-law and nephew). So my children have grown up close by to two sets of Great Aunts and Uncles - both of whom have played a big part in their lives over the past couple of years. I am SO grateful that my kids have had this chance, as I never had this growing up, and I don't think Luke did either - knowing they are enveloped by family just makes my heart sing. 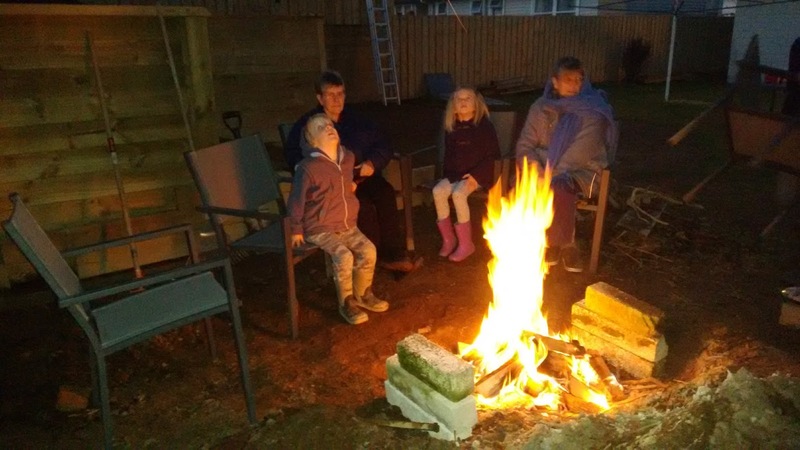 My Dad's younger brother and his wife, as well as my Mum's older brother and his wife; have all become sort of like other grandparents to the kids, and Aunts and Uncles to Luke... I have loved, loved, loved this. Unfortunately one set of Grandparents have since moved out of town, and one of my Aunts and Uncles have also moved away; but we stay in close touch despite this, as neither couple have moved to far. We have a bit of a busy schedule now though... with Wally for dinner on Monday's, Penny on Friday's and Mum on Saturday's; however, I wouldn't want it any other way! I was watching my daughter at church on Sunday; like me at the same age she is baby-crazy, and is drawn like a moth to light, to any baby that happens to be in attendance. This last Sunday it was our Pastor's son that got her undivided attention - he is about 15 months, and the cutest little man; and so she sat on the front row and distracted him the entire first half of the service, while my son went between her, us and his Uncle (my brother)... I remember thinking, even then, just how blessed and fortunate we are, to attend a church that is family-focused, and we know the children are safe, they can move around without being growled (as long as they are fairly quiet and respectful), and not only are they loved by many people there; but they are learning to love and care for those people as well. It really is a rare thing, and I love it... I love my church, I love the connections and friendships my children are making with many different people of many different ages, and I love how these are the things my children will remember and cherish as they look back on their childhood, just as I do mine.